An innovative new food and marine tourism course will see food and tourism businesses in Donegal work together to create "a unique visitor experience" for visitors exploring the Wild Atlantic Way. The part-time Certificate in Marine Tourism and Seafood Fundamentals course was launched by Donegal Cathaoirleach Cllr Terence Slowey at the LYIT Tourism College in Killybegs. This course is a key component of the Donegal Atlantic Coastal Trail and has input from a number of key organisations including Bord Iascaigh Mhara. LYIT School of Tourism head, Dr Sean Duffy said: “The course will introduce people to what marine tourism is all about and will have a particular focus on the seafood industry in Donegal. The course will be hands-on and will include guest speakers as well as visits to businesses operating in this sector." 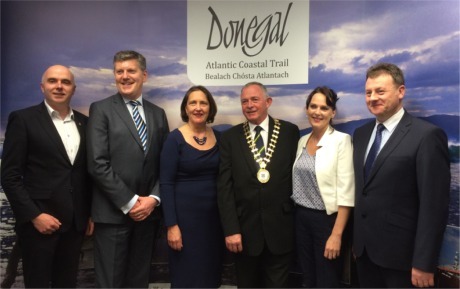 At the launch of the new tourism course as part of the Donegal Atlantic Coastal Trail project were: Cllr John Campbell, Dr. Seán Duffy, Meadbh Seoighe, Cllr Terence Slowey, Cllr Niamh Kennedy and Seamus Neely. The launch gathering was told that while there had been an increase in visitor numbers to the North West including Donegal, only 12% of Wild Atlantic Way visitors journey north of Galway. "This course is for everyone and because it is part-time it means that you can continue to work or to run your business while studying. It will be a great springboard for someone interested in this sector and in availing of the opportunities it presents. Donegal is competing with some very well experienced regions such as Kerry and therefore it is important that we are all on message and that everyone is telling our story and creating the unique and special experience that our visitors are looking for." For more information on the new course, call the School of Tourism (LYIT) on 074 91 86600.